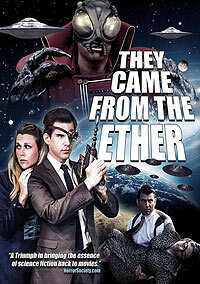 They Came from the Ether (2014) - Sci-fi-central.com. USA  2014  90m   Directed by: James Pronath.  Starring: Linnea Quigley, Judith O'Dea, Tom Gore, Paul Gibson, Christopher D. Fisher, Sherry Sparks-Jenkins, Jillian Teetsell, Bradley Eugene Greer, Eliza Farren, Rocio Thrasher, Tavis L. Baker, Jack Byrd, Roland James Williams.  Music by: Steven Grove. John Henry, a down on his luck salesman, is given a chance at success by an alien visitor, trading technology for help in human experimentation. Blinded by his ambition, the salesman open a doorway in which the alien can develop the means to control the human race. It's left to Detective Mike Washburn, who is investigating the missing persons reports, to get to the bottom of the disappearances.